Young Gerard Arpel feels alienated and constricted in his parents' house, in which ingenious modern gadgets replace human effort and precision scheduling passes for interaction. Therefore he loves to spend time with his Uncle Hulot (Tati), whose home resembles a nest at the top of a ramshackle old house in a lively, impoverished quarter of the city. Much of the humor of this delicately timed comedy comes from the relationship of these two innocents to the house itself, which functions like a frighteningly beautiful and entirely superfluous machine. A highlight of the film is the garden party thrown by the Arpels in a last-ditch attempt to distract Uncle with a lady friend and thereby gain back their son's attention; here minimal dialogue combines with maximum sound effects, brilliant color photography and choreographed movements to create a futuristic Fifties fantasy. Jacques Tati's first color film sends the iconic Monsieur Hulot (Tati) to busy Paris. Because he is unemployed, he spends the majority of his free time entertaining his charming 10-year-old nephew, Gerard Arpel. Hulot's sister (Adrienne Servantie) is grateful, but his brother-in-law (Jean-Pierre Zola), a strict man of logic who runs a giant plant with hundreds of workers, is concerned because he does not like how Hulot's head functions. Eventually, Madame Arpel asks her husband to give Hulot a job in the plant. After he reluctantly agrees, Madame Arpel also decides to introduce her brother to their next-door neighbor, an unbearably pretentious single lady, hoping that they could become a couple. Rather predictably, the disorganized Hulot not only fails to adapt to the working environment in the plant, but creates some serious problems for his brother-in-law. During a big garden party organized by his sister, Hulot also fails to impress the single lady. Around the same time, things in the ultra-modern Villa Arpel miraculously begin to fall apart. 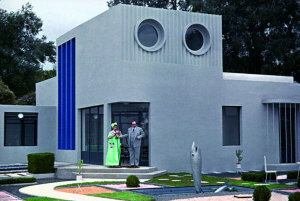 Tati's Mon Oncle very much reminds of Charlie Chaplin's iconic Modern Times. Like the Tramp, Tati's character is an outsider trying to be normal in a world where very little is. In the ultra-modern and ultra-clean Villa Arpel, for instance, Hulot looks like a lab rat whose behavior is carefully monitored by the camera. His minor failures and successes could be quite amusing - funny is not the right term to describe them - but also notably disturbing. Why? Because so much of the absurd has become part of modern reality. Though not as elaborate as that witnessed in PlayTime, the choreography is excellent. There are numerous sequences in which the movement of the different characters is incredibly well timed while the camera positioning is simply outstanding. The emphasis on detail is equally impressive. The architectural designs, the modern furniture and appliances, even many of the costumes and hats seen in the film are strikingly original. A portion of the film also takes place in old-fashioned Paris. This is a place where things tend to have familiar curves, life has a different rhythm, and people and animals look normal. It is where Hulot feels alive. Each time Tati's camera enters it after having spent some time in the sterile world of the Arpels, the atmosphere of the film changes dramatically. (Look for an entirely different range of warmer colors as well). The film does not have an elaborate soundtrack, but music has a very important role in it. It enhances its rhythm and eases the transitions the between the two worlds Hulot spends time in. - Dr. Svet Atanasov, blu-ray.com, 6 November 2014. This digital transfer was created in 2K resolution from the edited camera negative at Arane-Gulliver in Clichy, France, where the film was also restored. The 2013 restoration was undertaken by Les Films de Mon Oncle. The original monaural soundtrack was remastered at 24-bit at L.E. Diapason in Epinay-sur-Seine, France, from the optical track off the negative. Restoration supervisors: Jerome Deschamps & Macha Makeieff, Philippe Gigot. Image restoration: Arane-Gulliver, Clichy, France. Sound restoration: L.E. Diapason, Epinay-sur-Seine, France.